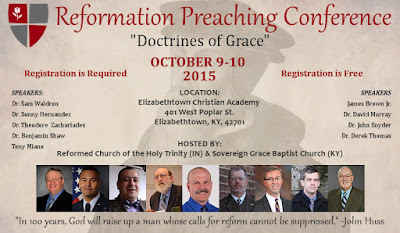 Reformed Church of the Holy Trinity and Sovereign Grace Baptist Church would like to invite you to Elizabethtown, Kentucky for a free two day conference on October 9th-10th, 2015. The Doctrines of Grace will be addressed theologically and practically to edify the saints in Christ’s Church to Biblically, clearly and properly fulfill the Great Commission. We have been brought to the kingdom for such a time as this. Join with us for RP15 as we equip the saints to destroy strongholds and every argument and lofty opinion against the knowledge of God in order to take every thought captive to obey Christ. Speakers this year include Dr. Derek Thomas, Dr. David Murray, Dr. Sam Waldron, Dr. Sonny Hernandez, Dr. Benjamin Shaw, Dr. John Snyder, Dr. Theodore Zachariades, Evangelist Tony Miano and Pastor James Brown Jr.
Reformation Preaching Conferences (RPC) is a ministry of Covenant Commission under the direction of Reformed Church of the Holy Trinity and is dedicated to discipleship, evangelism and ministry. Reformation Preaching Conferences is an annual conference provided free of charge to freely proclaim the Gospel of Jesus Christ throughout our society. RPC is supported through the offerings of God’s people. Please register today and let’s partner together to turn this world upside down for Christ!